Case Communications Industrial Ethernet Switches are designed to work reliably supporting mission critical applications under harsh conditions. Typically DIN Rail or Wall mounted the Switches operate from -40C to +75C without the use of fans. 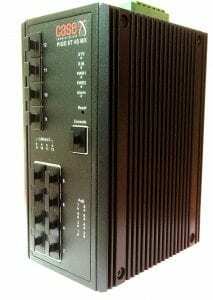 All Case Communications Industrial Switches are equipped with dual DC Power supplies, for additional resilience. The Non-PoE Industrial Switches operate from 12vdc to 48vdc while the PoE and PoE plus switches operate from a 48vdc power source. Industrial Ethernet - is the use of Ethernet in an industrial environment with protocols that provide deterministic and real-time control. 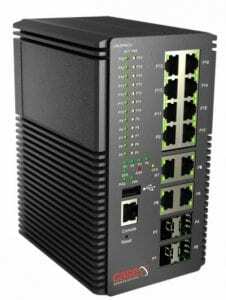 Protocols for Industrial Ethernet include PROFINET, MODBUS/TCP, POWERLINK, SERCOS III and CC-LINK IE. Many Industrial Ethernet protocols use a modified MAC layer to provide low latency and determinism. The use of fibre Ethernet reduces the problems of electrical noise and provides electrical isolation to prevent equipment damage. Some industrial networks emphasise deterministic delivery of transmitted data, whereas Ethernet uses collision detection which makes transport time for individual data packets difficult to estimate with increasing network traffic. Typically, industrial uses of Ethernet employ full-duplex standards and other methods so that collisions do not unacceptably influence transmission times. 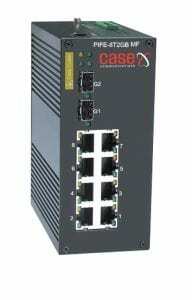 The Case Communications Industrial Ethernet Switches provide link redundancy using STP (Spanning Tree Protocol IEEE 802.1D), RSTP (Rapid Spanning Tree IEEE 802.1w ) and MSTP ( Multiple Spanning Tree Protocol IEEE 802.1s) , and for the quickest self healing time, the switches use Advanced Ring Technology will allows the network to self-heal in 10ms to 20ms. 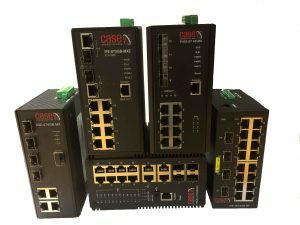 Case Communications Industrial Switches support Static VLANS, Port and Tagged based VLANS, as well as Q in Q (VLAN Stacking). The Case Communications Industrial Switches support quality of service based on industry standard features such as 802.1p, IP Tos etc. Industry Standard SFP’s (Short Form Pluggables) ensure any distance and type of Fibre can be supported, and the switches all support DMI ( Dynamic Management Interface) allowing the fibre to be monitored from a central point with SNMP Traps or e-mails sent in the event of a fibre degradation or failure. 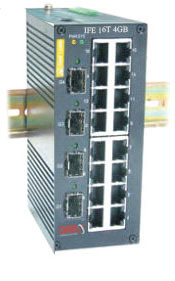 The Case Communications Ethernet switches which support Power over Ethernet support both the standard PoE (IEEE 802.3af (15 watts at 48 volts DC)) and PoE+ (IEEE 802.3at (30 watts at 48 volts DC)). This allows the switches to power third party devices such as Pan, Tilt and Zoom CCTV, and Wi-Fi, and Wireless products etc. The Case Communications Industrial Ethernet Switches support IEEE 802.3ad LACP Link aggregation allowing multiple trunks to be bonded to form a single high speed pipe. Management is via a HTTP / HTTPS, Browser, CLI or SNMP with the switches sending SNMP Traps to a Network Management System as well as being able to trigger a local relay port. Security logon is provided either using the switches internal security or a RADIUS server. File management allows Firmware upgrades or backups and also configuration upload and download.